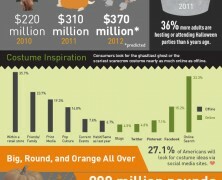 A compilation of market trends, habits and statistics of the Halloween etiquette with some historical highlights. The first ThanksGiving was a 3 day feast and was established by the founders of Plymouth colony. See how the traditional habits in terms of menu variety, food consumption, spending and of course gathering volume have changed since then. A breakdown of Americans’ spending on Halloween candy and costumes from 2003 to 2012 with an estimation of $8 Billion total expenditure. Halloween is around the corner and as Americans like spending a fortune on adornments, costumes and candies, it’s good to see the industry behind the celebration. Happpy Halloween. Bhhhahaaaaa.